Know whose turn it is. all of you. Keep track of whose turn it is to do tasks. Sync with everyone involved in the task, no matter if they are on iOS or Android. Designed to make it dead simple to create tasks and add turn takers. If more than 2 people are taking turns, the left-most user is always the last one to have completed the task. The ones to the right are in order of likelihood to be next. 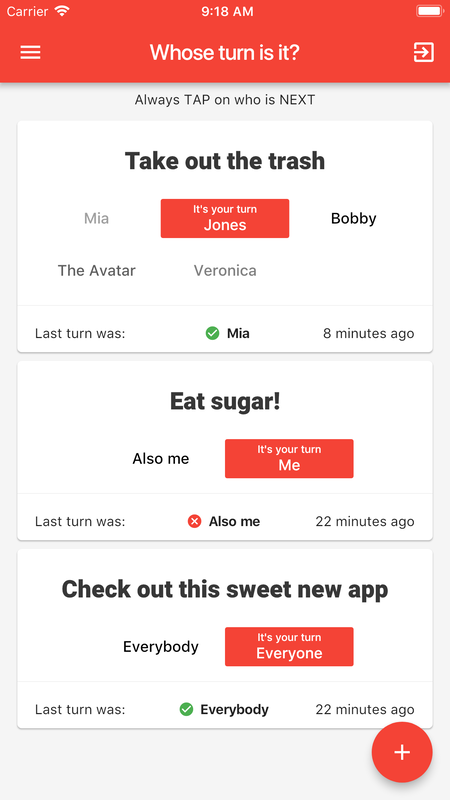 All you have to do is TAP on who is next when the current turn taker has completed the task. The darker the user's name, the more likely they are to be next. Android, Ios, Phones and Tablets. Send a link to anyone so they can join your task. If they don't have the app installed, the link will bring them to the app store/play store. People you invite can't modify the task, they can only change whose turn it is. One in app purchase to remove ads. That's it. All the data is stored in the cloud. That's what makes sync work. It also means server costs. The free version of the app has ads, and ONE in-app purchase removes them. That's it. No other scheme.